In January 1943, Northrop was awarded a USAAF contract for the design and construction of three prototypes of a highly original rocket-propelled interceptor fighter of all-wing configuration and designated XP-79. 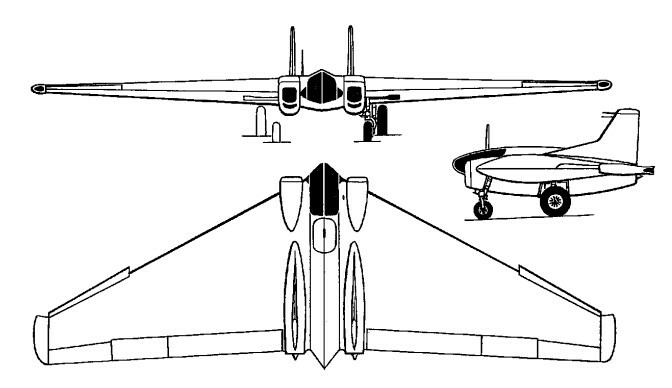 By 1944 Northrop had a range of projects stemming from the MX-324, including Ram Wing. This was a true flying wing with tip-duct bellows spoilers, and a pilot lying prone to fit within the wing pro-file and withstand violent combat manoeuvres. To be powered by a single 907kg Aerojet rocket motor, the XP-79 was to have accommodated its pilot in the prone position, but, in the event, development problems with the rocket led to cancellation of the project. However, a contract was placed for the redesign of the fighter for turbojet power, one prototype being ordered as the XP-79B. It was schemed in various forms but the basic concept was that the wing should have a leading edge of thick magnesium endowing it with exceptional impact strength. Unlike almost every other flying machine in history the XP-79 was planned with mid-air collision as a basic design case. Its four 0.50in guns were officially called "secondary". There were still no powerful rocket motors and Northrop built the XP-79B with two of the new turbojets. The engines chosen were the 19‑inch Westinghouse Navy axials, which as the pre‑production J30 (model 19B) were each rated at about 1,150 1b / 619kg. This was judged enough to make the 8,670 lb XP‑79B a practical proposition, and technically it was a design of exceptional interest. The pilot was accommodated in a modified cradle, stressed for sustained 12g manoeuvres, with an engine close on each side. To overcome the nose‑gear problem there was "a wheel at each corner", each leg folding into the wing. After testing with no fin or with a central fin it was decided to fly with a fin above each jet. The aircraft that bore AAF serial 43‑52437. It was delivered to Muroc in June 1945 to start testing with Harry Crosby as a test pilot. Flown for the first time on September 12, 1945, after several days of preliminary tests, an incident marked the beginning of the flight when an Army Air Force fire truck crossed runway. Crosby had time to cut the power to avoid the collision, then he climbed to 10,000 feet. Crosby seemed quite at home, and flew confidently for 15 minutes. He returned to his take-off area by describing a large circle with a particularly high speed (estimated at more than 400 mph). 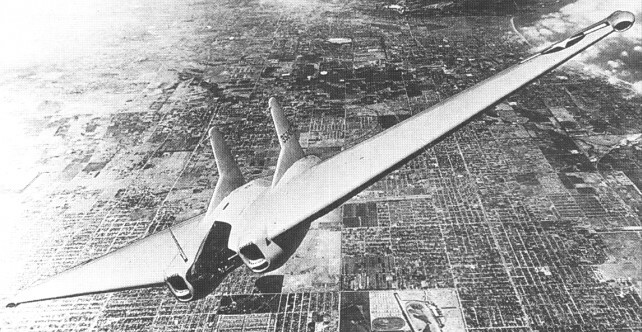 On his second pass over the salt lake, Crosby started a climbing turn, then the Ram Wing went into an agonizingly slow roll and went straight into the ground in "a steep vertical spin". Crosby wss seen jumping at the last moment but was struck by a portion of the plane. His parachute never opened. The cause was attributed to a hard‑over runaway by the electric trim‑tab in the lateral control system. As the war was over ramming was dropped.